Facebook’s new data center in Oregon has gotten its fair share of attention, both for Facebook’s decision to open up the energy-efficient design, and also for Greenpeace’s campaign to try to convince Facebook to stop powering it with coal. But here’s another reason to recognize the data center: Facebook has installed a smart lighting system courtesy of startup Redwood Systems. Sam Klepper, Chief Marketing Officer for Redwood Systems, tells me Facebook is currently using Redwood System’s technology to control over 1,000 lights in Facebook’s data center in Oregon, and Facebook plans to add the lighting system to the rest of the buildings at the Oregon data center shortly. Klepper says Redwood Systems is also talking to Facebook about implementing the technology in Facebook’s upcoming data center in North Carolina. Redwood Systems makes lighting digital, networked and intelligent. The three-year-old company makes a control and sensor system for LEDs (light emitting diodes) that runs over an optimized version of ethernet cables. Commercial building owners and data center operators can use the LED lighting control and management system to cut the amount of lighting used throughout the building, in some cases up to 70 percent over standard non-networked fluorescent lighting systems. LEDs are more efficient than fluorescents, but Redwood’s management system also monitors the building environment, including temperature and room occupancy, and can dim and manage the lights to help maximize efficiency. Klepper told me a typical return on investment, in terms of energy savings for the lighting system, is between two to five years after installing the system, depending on different factors. Around 40 percent of Redwood System’s customers right now are in the data center space, said Klepper, who added that percent will likely grow over the coming months and years. Klepper also said Facebook is interested in the lighting technology partly because it’s combining lighting efficiency with overall building intelligence, and Redwood’s sensors can alert managers when panels for hot/cold aisle containment have been left open, or, say, when there is movement in certain sections of the data center. 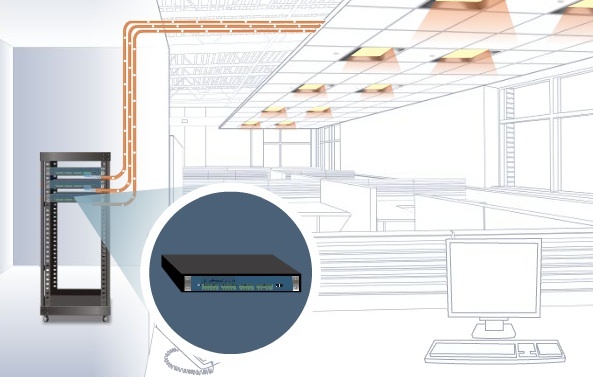 Redwood uses its optimized communications cables to send both a digital signal (zeros and ones of information) as well as power, and each LED fixture contains an embedded sensor that can monitor the environment of the room. The LEDs are then connected to the centralized Redwood computing engine. Dave Leonard, co-founder and CEO of Redwood Systems, left Cisco’s (s csco) wireless division to start the company. The company is backed by at least $27 million from Index Ventures, Battery Ventures and U.S. Venture Partners. There are a variety of competitors offering similar lighting management systems, including Digital Lumens and Adura Technologies, as well as offerings from building automation companies Honeywell (s HON) and Johnson Controls (s JCI). Smart lighting could be a massive market. The Electrical Power Research Institute (EPRI) reported only seven percent of the U.S. commercial and industrial market have installed lighting control systems of any kind.